Words of Wonder is the latest anthology produced by the creative writing students of Nottingham College. Here is my review. This is a wonderful non-fiction piece about food. I loved the conversational style of the writing and, as I have a great interest in eating, the subject matter also. I found myself nodding along, trying to work out the seven ways to eat carrots and wanting to chat further with this author as I’m in total agreement with her ‘giving it another go’ philosophy. Oh, and if she could bring along some of that Cheaty fudge, or the usual sort, I’m not fussy, that would be terrific! I liked this story. It has an eerie feel to it, right from the start when a man is sleeping rough in a churchyard. However, the ending completely took me by surprise. It was well-written but I didn’t know the reason why the thing that happened happened and wondered if I’d missed something. This was very well written. I loved the way the author described the way the administrators toiled in their departments as though she were talking about a river. Great story too. I’m a big fan of random acts of kindness so this story was terrific. It was really well told too which meant I felt for the characters and the ending was great, understated, simple, nothing else needed to be added. Anyone who reads my reviews will know that I’m not a huge fan of fantasy so this one was something of a stretch for me. The story takes place in and around a grand house where there is a death, possibly a murder, which brings Deliu everything he wants but nothing but trouble by way of nightmares and spiritual interference. Nice descriptions though and great imagination! This author has used her knowledge of Bess of Hardwick and woven that into a story about Rufford Abbey adding a paranormal edge, though by the end I wasn’t sure if this was a true story or not – which was interesting. It is always nice to see an author confident in what they are writing about because they know their stuff and you then trust and have confidence in everything they say – well done! Oooh, how familiar this piece was. I once read that the most frightening time for a writer was that moment just before you begin to write – is there anything there? Do you know what’s next for your characters? So often your mind is a blank and this autobiographical piece covers all those feelings nicely and is very well written too. Rory was living in Norwich but has to return home when his only remaining parent, his father, dies suddenly. The house he returns to sounds idyllic and is filled with memories, but then the Twitchers arrive and Rory has to launch a cunning plan to get them to leave him alone. I was terribly envious of Rory’s home, and lifestyle actually, and could picture it exactly which shows what a great job this author did. Loved the ending too. This is a story about Milo and I have to say I did wonder for a while what was going on but it does all become clear at the end of the story which I won’t give away. There is a lot of description which sometimes was a little too much and slowed the story down a tad (sometimes less is more) while at the same time building a solid picture of the setting. This is a story told from the point of view of an eight-year-old girl and it’s about her babysitter, Stella Valentine. I thought it was terrific. I really enjoy things told from a child’s pov as they so often view events with an innocence where everything is taken literally and this holds true in this story. A dark storyline but very well told and written. What a wonderful ending to the prose section. A memoir, I believe, and a fabulously well told story of a mother and daughter and their relationship with a boat. Moving, and very well written. There then follows a section bulging with poetry and Haikus from Marjie Griffiths, Jane Daskin, J.D. Hackett, David Steele, Grace Michu, Emma Penny and Bella Rye. Again, as readers of my blog will know I’m usually not that fond of poetry but actually I really enjoyed reading through these – perhaps I am growing up at last and am finally finding an appreciation for poetry. Well done to all these authors, I know how hard poetry is to write and I applaud all your wonderful verses. 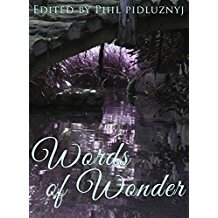 Thank you Georgia for reviewing this anthology. It has been a wonderful experience to be part of this published work with my co-authors and tutors. As always Georgia, an excellent review. I am not involved with this anthology but was in the ‘Straight from the heart’ anthology which you have previously covered. Your reviews are sensibly balanced and you praise when deserved but also constructive with criticism which I personally feel is very helpful in the early stages of writing. In short it is because of your review that I shall be seeing for myself what these short stories are all about. Thanks, Georgia. I love anthologies like this..Heading over there now. If you get it, Judith, I do hope you enjoy it 😀 thanks for commenting!